Happy Monday! This is the last week of the Spiderforest Comic of the Week promotion, so let’s look at the last two Featured Comics of 2016! Damsels Don’t Wear Glasses: Lave Faraday, a natural human living in the Multi-magical city of Persephone is assigned to protect Jake D’Crux, a twelve year old danger magnet who has yet to understand the supernatural world he now finds himself in. But things only get more complicated when Lave finds herself fighting off the denizens who scrabble to take Jake for their own ends. The Only Half Saga: Garrett Kelly, Wanderer for the supernatural hunting organization, Victor Sierra, gets wind of Cabal’s possible location and goes hunting. What he finds is completely different from his original quest. 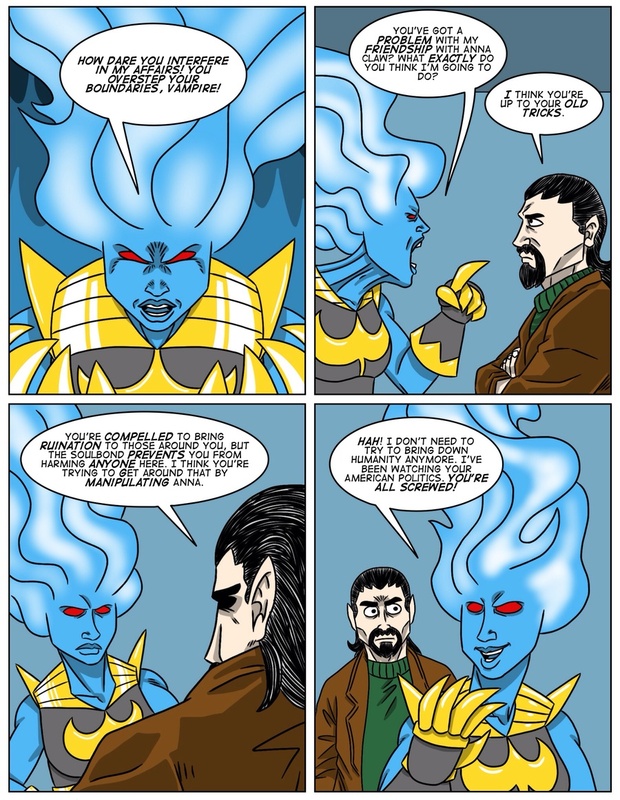 You can leave comments by clicking here, leave a trackback at http://supervillainous.spiderforest.com/comic/true-blue/trackback/ or subscibe to the RSS Comments Feed for this post. Ow… low blow Si’ri. Low blow. Urg. You know it’s bad when the demoness who is determined to bring ruin to mankind through manipulation decides she can stop manipulating. Not that I believe her. She is a manipulator after all. She lies. Because she is a demon and is trying to manipulate the powerful vampire into action which would bring about ruination? In all practicality Trump (if he was elected in the world of supervillainous) will be a fine president – maybe sometimes good, maybe sometimes bad but overall probably fine. However getting a vampire to take action against him (or anyone else) would create a crisis which could easily spin out of control bringing real harm to a great number of people (and potentially kickstarting WWIII if a foriegn power is blamed – irrespectively of responsibility) – and that war could be fought with super powers and alien tech. But than I am not an American (or living in America) and so my view of fictional American politics might be different than those who are. @ Ladon: Honestly, she says what the rest of the world thought when Trump won. @ Gianluca Burdon: There’s a huge gap between G.W. Bush & Trump. Bush was a potential disaster because we already knew that he didn’t know how to run things, and was, through incredibly dodgy legality, reelected. Basically a political disaster, but the people around him knew how to deal with Bush, and Bush was willing to “play the game” that is politics. Trump, however, has outright stated that he’s not going to “play the game”, has promoted his business savy despite his numerous bankruptcies, has shown through the business community that he doesn’t think long-term, has already demanded impossible things, and, honestly, to a certain degree it doesn’t seem like HE thought that HE would win until near the end. In other words, while Bush was a disaster for legal reasons and international public relations, Trump looks like he’s going to make all the disasters that was expected for Bush look like a friendly sparring match to his all-out-civil-war. Hell, ignoring the potential damage, I’ve heard news reports of Gay and Racial Bashings in the US increasing after Trump was stated to be the President Elect. That alone is a big enough problem with him, that the Racist and Homophobic Communities see his election as permission to violently discriminate. There was a more than 50% increase in hate crimes after it was announced trump was president-elect. Draw your own conclusions. So is America facing a growing hate crime epidemic, fueled by Trump’s campaign for president and election? The truth is very unsettling: We have no idea. Other similiar references exist also – but I would be interested in reading your 50% increase source. Also we still don’t know if it is even an election year within the world of supervillainous (I suspect it will not be important to the story). Actually, thinking about it, Si’ri is probably the person who knows the politicians best due to being, well, the Supervillianous Version of Apple’s Siri. This means that she can (and might actually have to) spy on anyone who uses an Apple (or local equivalent) Phone with little to no consequences, and without anyone actually knowing. As this likely includes many major politicians, she likely knows what they’re really like behind closed doors. To the point where her “watching American Politics” could be a reference to her outright spying on the politicians for her own amusement. I feel like everyone is overthinking things and her comment on American politics is just a one-off gag. I guess all she needs is a limitless supply of popcorn to watch the show.